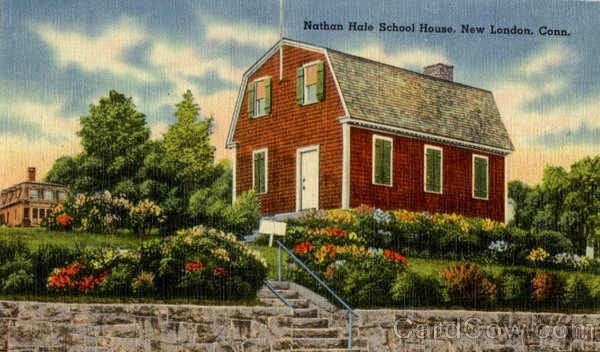 Nathan Hale, considered the state hero of Connecticut, taught for two years in a small red schoolhouse in New London. Thought it’s been moved several times, it now stands in a prominent place in the area of the redeveloping waterfront of the city. Having graduated at the age of eighteen from Yale University, and briefly suffered what he described as the “remote life in the wilderness” in nearby Moodus, he took over the teaching job at what was then the Union Grammar School, from 1774 to 1775. Subsequently enlisting in the fight for independence in the American Revolution as a Captain, he volunteered to become a spy against the British troops who had captured Long Island. The schoolhouse is of interest on several levels, literally, as it has the unique distinction of being a two-story building with many of its architectural elements still visible. Open in season from May to October (and Wednesday through Sunday only), a visit can be combined with the other extant Nathan Hale Schoolhouse in nearby East Haddam (home of the famed Goodspeed Opera House for the last fifty years). As most schoolchildren learn, Hale’s famous last words in September 1776, before he was hanged as a spy (at the tender age of twenty-one) by the British, are said to be: “I only regret that I have but one life to lose for my country”.